Citation: C N Trueman "The Attack on Poland"
historylearningsite.co.uk. The History Learning Site, 14 May 2015. 5 Apr 2019. How did Germany achieve such an overwhelming victory? While the German Army had been developing new tactics and building new fighting vehicles to implement these tactics, the Polish Army, like many others in Europe, had stayed with a World War One mentality. A comparison of both armed forces clearly indicates the problems faced by Poland. Germany had one cavalry brigade compared to Poland’s eleven, some of who can be seen below. In terms of air power, the Germans had 850 bombers and dive-bombers (the JU-87) and 400 fighters. The Polish Air Force numbered 210 bombers and 150 fighters – though many of these were obsolete and clearly no match for the modern Luftwaffe that destroyed the Polish Air Force within two days of the first attack. The Polish Navy consisted of four destroyers, five submarines, two gunboats, a mine-layer and six mine sweepers – which meant that any German attack from the sea could not be repulsed. Despite the terms of Versailles, Germany had built a modern navy that totally outclassed the Polish Navy. An army group led by von Rundstedt attacked from the south while another army group led by von Bock attacked from the north. There had never been such a large mechanised attack before and General Walter Nehring, who worked under Heinz Guderian, claimed that many of the Wehrmacht’s senior officers were apprehensive as they had nothing to turn to if the attack failed or was stalled. One of the main concerns of those in charge, other than whether a mechanised attack would work, was that the German army was attacking in the north and south of Poland – but with very little in the middle to oppose any Polish counter-attack. There was a 185 mile gap between the German VIII Army based in the south in Silesia and the German IV Army in the north based in Pomerania. Between the two was Poland’s Poznan Army and for a while it posed a theoretical threat to the Wehrmacht with the potential to punch a hole into the rear of either German army and disrupting its progress. To ease this problem, the Germans put all their faith in a lightening attack that would a) militarily hammer the Poles and b) create such chaos in Poland that any form of a unified Polish attack simply would not occur. For the Germans, speed and success went together. By rolling back the Poles, the Germans assumed that they would always be advancing and any Polish unit would simply fall back in disarray even if it was not directly involved in a battle – such was the chaos and breakdown in command the Germans hoped to achieve. If the Poles were going to counter an attack, this has to be done before either German army group had advanced far into Poland. 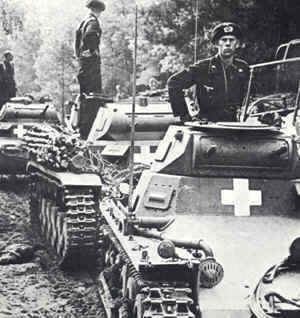 Both army groups had Warsaw as their target. As they both advanced, the 185 mile gap between them got smaller and smaller; the nearer both army groups got to each other, the more formidable they became. Also, the nearer both army groups got to each other was symptomatic of how far they had pushed back the Polish military, that by mid-September was in disarray. A Polish counter-attack at Bzura simply could not be sustained. The Poles had placed great value on the River Vistula to act as a natural barrier to any form of military advance. The Germans crossed the river on Day 5 of the attack. By this time, the Polish air force had been defeated and this had stripped the Polish Army of any form of air cover – it also meant that the Poles were easy targets for the Luftwaffe which was free to operate in Poland after September 2nd. When the Russians invaded eastern Poland on September 17th, the defeat of Poland was sealed. On September 24th, Warsaw was bombed by 1,150 German aircraft. On September 27th, Warsaw surrendered. The last Polish troops to surrender did so on October 6th. No-one doubts that the Polish military put up a brave fight but they were the first army to feel the full might ofblitzkrieg – a tactic that was to push the British and French armies back to Dunkirk in 1940. Tanks versus a primarily non-mechanised army could only lead to one result. Ironically, many point to the impact of German tanks during the campaign. Yet it is known that many of the tanks used during the attack were equipped only with machine guns or small calibre guns – compared to later tank designs. What did the damage was the constant onslaught of all parts of blitzkrieg, including large numbers of tanks, that never allowed the Polish Army to gather its breath and re-group. Complete air superiority gave the Germans every opportunity to attack the retreating Poles – and fleeing civilians did a great deal to hinder a controlled withdrawal by the Polish military. According to the man credited with developing Germany’s blitzkrieg, Heinz Guderian, even Hitler was taken aback by its success. According to the German, the Polish campaign cost them 8,082 men killed, 27,279 wounded and 5,029 missing in action. German tank losses included 217 destroyed and the Luftwaffe lost 285 planes destroyed and 279 damaged beyond repair – about 25% of all German planes in September 1939. These figures do show that the victory was not as easy as the very short time span and simple statistics might indicate. In total, 90,000 Polish military personnel escaped to either Hungary or Rumania and a number of Polish airman fought with distinction in the Battle of Britain.